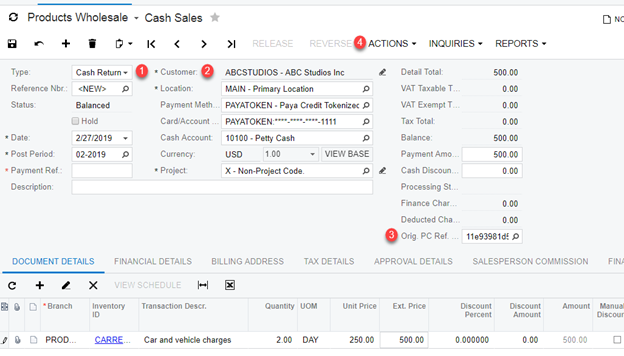 These are the instructions on how to process credit card payments against a cash sales order within Acumatica. Cash sales are situations where a customer may pay for goods/services prior to an invoice being created. Select Cash Sales from the type dropdown. Select the correct line item and click save. Click the Action tab and select authorize CC payment. Once the AUthorize CC payment is complete, the processing status, PC response, and Pre-Auth number are generated. Click on Capture CC payment to capture the authorized transaction. Processing Status is changed to captured. PC Response and the Capture Tran number are generated. Click on Void CC Auth/payment button. The Processing Status is changed to Voided and the Pre-Auth and Capture Trans numbers are set to default. In the Sales Order screen select Order Type as Cash Return. Add an invoice by clicking Orig PC Ref field and click Save. Create, prepare, then release the invoice. Initiate the refund by clicking Action tab then Refund CC Payment. The Processing Status will update to Refunded once refund process is complete.